Download "18 BUSINESS ACCOUNTING STANDARD FINANCIAL ASSETS AND FINANCIAL LIABILITIES I. GENERAL PROVISIONS"
1 APPROVED by Resolution No. 11 of 27 October 2004 of the Standards Board of the Public Establishment the Institute of Accounting of the Republic of Lithuania 18 BUSINESS ACCOUNTING STANDARD FINANCIAL ASSETS AND FINANCIAL LIABILITIES ( Valstybės žinios (Official Gazette), 2004, No ; 2006, No ; 2007, No. 1-55). I. GENERAL PROVISIONS 1. The objective of this Standard is to set out a procedure of recognising, measuring, accounting for, and presenting in financial statements financial assets and financial liabilities. 2. This Standard shall be applied to all types of financial assets and financial liabilities except for: 2.1. investments in subsidiaries and associates, which are accounted for under 14 Business Accounting Standard Business Combinations, 15 Business Accounting Standard Investments in Associates, and 16 Business Accounting Standard Consolidated Financial Statements and Investments in Subsidiaries, and which are acquired with no intention to sell them; 2.2. amounts receivable and liabilities arising from financial leases, which are accounted for under 20 Business Accounting Standard Operating Lease, Financial Lease, and Loan-for-Use ; 2.3. provisions and contingent liabilities, which are accounted for under 19 Business Accounting Standard Provisions, Contingent Liabilities and Contingent Assets, and Events after the Balance Sheet Date ; 2.4. financial assets and financial liabilities arising from derivative financial instruments, such as financial options, futures, forwards, etc., which are accounted for under 26 Business Accounting Standard Derivative Financial Instruments ; and 2.5. financial liabilities arising from insurance contracts. 3. If another Business Accounting Standard establishes accounting requirements for a certain type of financial assets and financial liabilities, they are recorded in accounting and presented in financial statements according to the procedures established by that Standard. II. KEY DEFINITIONS Active market a market in which the items traded are homogeneous, willing buyers and sellers can normally be found at any time and prices are available to the public. Amortised cost of a financial asset the acquisition cost of a non-current financial asset minus principal repayments, plus or minus the cumulative amortisation of any difference between the acquisition cost and the maturity amount, and minus the amount of impairment of this asset. Amortised cost of a financial liability the acquisition cost of a non-current financial liability minus principal repayments, plus or minus the cumulative amortisation of any difference between the acquisition cost and the maturity amount. Repurchase transaction a transaction of transferring a financial asset to another party in exchange of cash or other acceptable consideration with a concurrent obligation to repurchase the financial asset during a specified period of time on specified conditions. Effective interest method a method of calculating the amortised cost applying an effective interest rate of a financial asset or financial liability. Effective interest rate an internal rate of return of a financial asset or financial liability that discounts the flow of estimated future payments to the carrying amount. Factoring an agreement to sell the entity s amounts receivable. 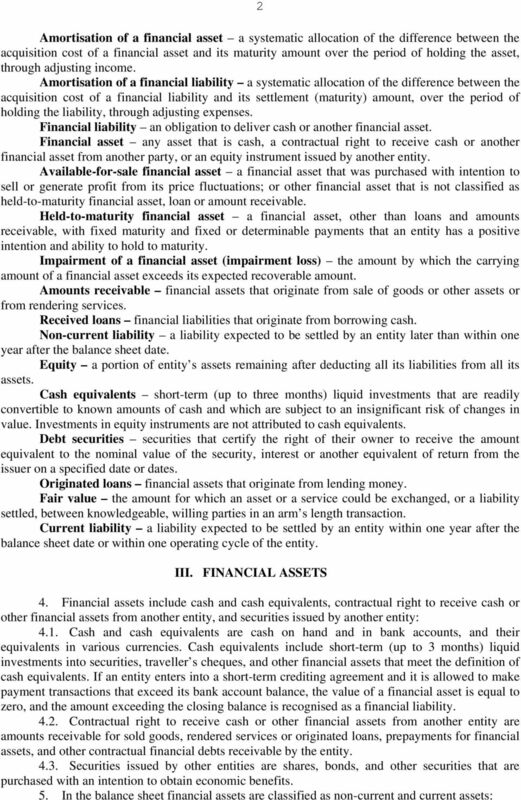 3 non-current financial assets (except for the current portion of amounts receivable and originated loans) comprise: non-current investments into other entities; originated long-term loans; amounts receivable after one year; and other financial assets that meet the definition of non-current assets current financial assets (including the current portion of amounts receivable and originated loans) comprise: current investments into other entities; originated short-term loans; amounts receivable within one year; cash and cash equivalents; other financial assets that meet the definition of current assets. 6. In the balance sheet cash is usually included in current assets. However, if the use of cash is restricted for more than one year, i.e., cash is held in a deposit account, it shall be presented as non-current assets. 7. Measurement of financial assets depends on the purpose of purchase. For the purpose of measuring, financial assets are classified into four categories: 7.1. available-for-sale; 7.2. held-to-maturity; 7.3. originated non-current loans and amounts receivable (including the current portion of non-current loans and amounts receivable); and 7.4. originated current loans and amounts receivable. 8. Examples of available-for-sale financial assets include purchased loans or other amounts receivable, other entity s shares, bonds or other securities purchased by an entity for trading purposes. Available-for-sale financial assets also include non-current financial assets that the entity intends to sell within one year after the balance sheet date. 9. Examples of held-to-maturity financial assets include bonds with a fixed interest rate and specified maturity date, if the bond-owner intends to hold them to maturity or to receive substantially all their carrying value. Equity securities are not considered to be held-to-maturity financial assets, since their maturity is not usually specified. 10. Available-for-sale financial assets are classified as held-to-maturity financial assets only when an entity which acquired them has an intention and ability to hold them until maturity date without taking an opportunity to sell. 11. Financial assets are not classified as held-to-maturity financial assets if: an entity intends to hold financial assets for an indefinite period; an entity is prepared to sell the financial assets; the issuer has a right to repurchase the financial asset for the amount significantly lower than its amortised cost. 12. The examples of originated non-current and current loans and amounts receivable include customers, loan receivers, employees and other financial debts to an entity. 13. Financial assets do not include prepayments for non-financial assets, e.g., non-current tangible assets, intangible assets, inventories or services. IV. FINANCIAL LIABILITIES 14. Contractual obligations to pay cash or deliver other financial assets are classified as financial liabilities. 15. Examples of financial obligations include amounts payable for received goods or services, loans and interest, received prepayments for financial assets on sale. 16. The entity s obligation to issue its equity instruments or to deliver them is not a financial liability, since the entity is not obligated to pay cash or transfer other financial assets. 4 4 17. Convertible bonds are recorded in accounting and presented in the balance sheet as financial liabilities until their conversion into ordinary shares. 18. Preference shares, despite having some features of financial liabilities, are attributed to the entity s equity. 19. In the balance sheet financial liabilities are classified as non-current and current liabilities: non-current financial liabilities (except for the current portion) comprise: amounts payable after one year; other financial liabilities that meet the definition of a non-current liability current financial liabilities (including the current portion of non-current liabilities) comprise: amounts payable within one year; and other current financial liabilities that meet the definition of current liabilities. 20. The value of financial liabilities in accounting and financial statements depends on their nature and the chosen method of measurement. For the purpose of measuring, financial liabilities are classified into three categories: linked to market prices; non-current not linked to market prices; and current not linked to market prices. 21. Financial liabilities are classified as linked to market prices if a change in their value is linked to fluctuations in the fair value of certain securities or in a market quoted rate that determines the fair value of these securities. 22. Examples of financial liabilities linked to market prices are: securities borrowed from another entity and sold for a time in an active market that must be returned to the lender after buying them back in the active market at the closing quoted market price. These financial liabilities usually arise from an intention to receive economic benefits from a short-term decrease in a security s price; contractual obligation, the amount of which changes in proportion to the quoted market rate. 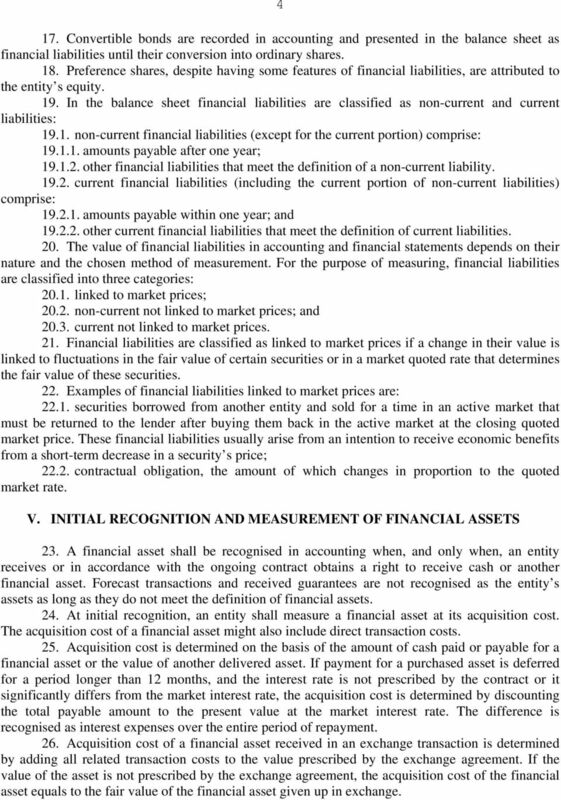 V. INITIAL RECOGNITION AND MEASUREMENT OF FINANCIAL ASSETS 23. A financial asset shall be recognised in accounting when, and only when, an entity receives or in accordance with the ongoing contract obtains a right to receive cash or another financial asset. Forecast transactions and received guarantees are not recognised as the entity s assets as long as they do not meet the definition of financial assets. 24. At initial recognition, an entity shall measure a financial asset at its acquisition cost. The acquisition cost of a financial asset might also include direct transaction costs. 25. Acquisition cost is determined on the basis of the amount of cash paid or payable for a financial asset or the value of another delivered asset. If payment for a purchased asset is deferred for a period longer than 12 months, and the interest rate is not prescribed by the contract or it significantly differs from the market interest rate, the acquisition cost is determined by discounting the total payable amount to the present value at the market interest rate. The difference is recognised as interest expenses over the entire period of repayment. 26. Acquisition cost of a financial asset received in an exchange transaction is determined by adding all related transaction costs to the value prescribed by the exchange agreement. If the value of the asset is not prescribed by the exchange agreement, the acquisition cost of the financial asset equals to the fair value of the financial asset given up in exchange. 5 VI. INITIAL RECOGNITION AND MEASUREMENT OF FINANCIAL LIABILITIES Financial liabilities shall recognised in accounting when, and only when, an entity assumes an obligation to deliver cash or another financial asset. Forecast transactions and originated financial guarantees that are not yet due are not recognised as the entity's liabilities as long as they do not meet the definition of a financial liability. 28. At initial recognition, an entity shall measure a financial liability at cost, i.e., at the value of the received asset or service. Related transaction costs shall be recognised as expenses in the income statement in the same period when they are incurred. 29. The cost of a financial liability incurred in an exchange transaction is determined on the basis of the value prescribed by the exchange agreement. If the exchange agreement does not prescribe the value of the newly incurred liability, the cost of the financial liability equals to the fair value of the financial liability given up in exchange. VII. SUBSEQUENT MEASUREMENT OF FINANCIAL ASSETS 30. 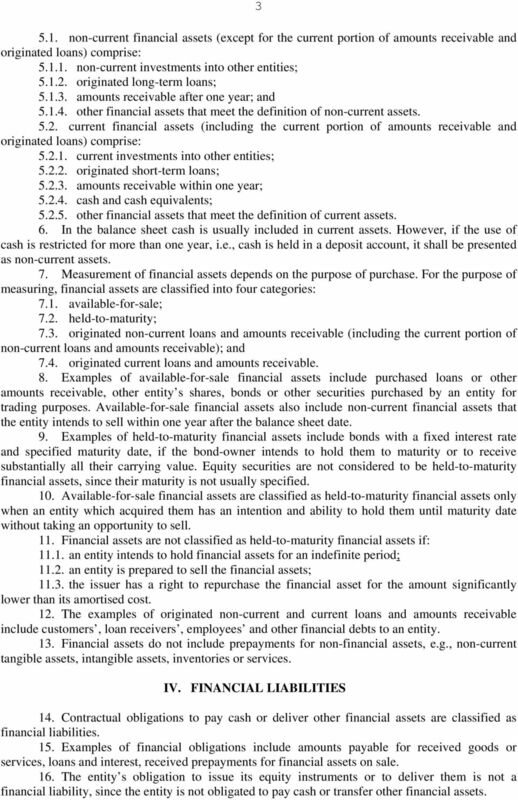 At each balance sheet date financial assets shall be remeasured as follows: available-for-sale financial assets shall be measured at their fair value; non-current loans and amounts receivable (including the current portion of noncurrent loans and amounts receivable), and held-to-maturity financial assets shall be measured at amortised cost; and current loans and amounts receivable shall be measured at acquisition cost less impairment (loss due to decrease in value). 31. Investments in securities that do not have a quoted market price in an active market and whose fair value cannot be determined, in financial statements shall be measured at acquisition cost less impairment (loss due to decrease in value). 32. Financial assets that are not measured at fair value and have fixed maturities shall be measured at amortised cost using the effective interest rate method. 33. The entity s originated or taken over non-current loans and amounts receivable after one year are measured at amortised cost, regardless of whether the entity is intends to hold them to maturity. 34. 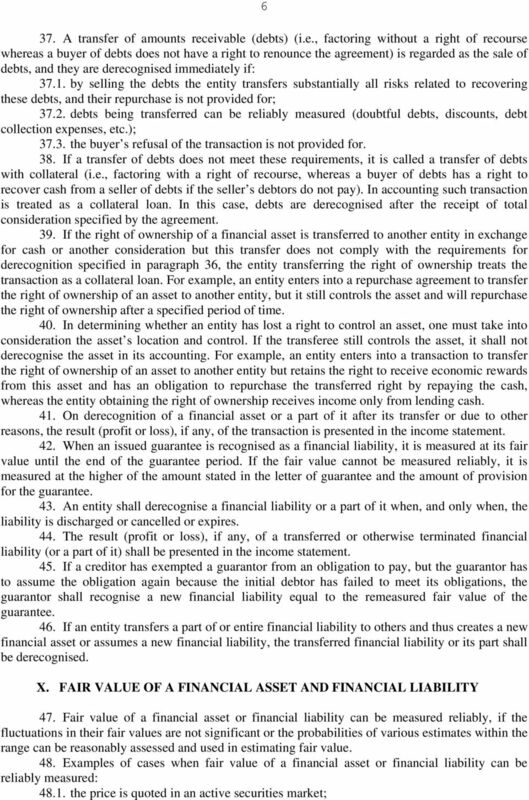 If the entity s intentions or abilities change, financial assets are reclassified into another financial asset category specified in paragraph 7 of this Standard. In this case, assets shall be remeasured according to the measuring requirements applicable to this category of assets. VIII. SUBSEQUENT MEASUREMENT OF FINANCIAL LIABILITIES 35. 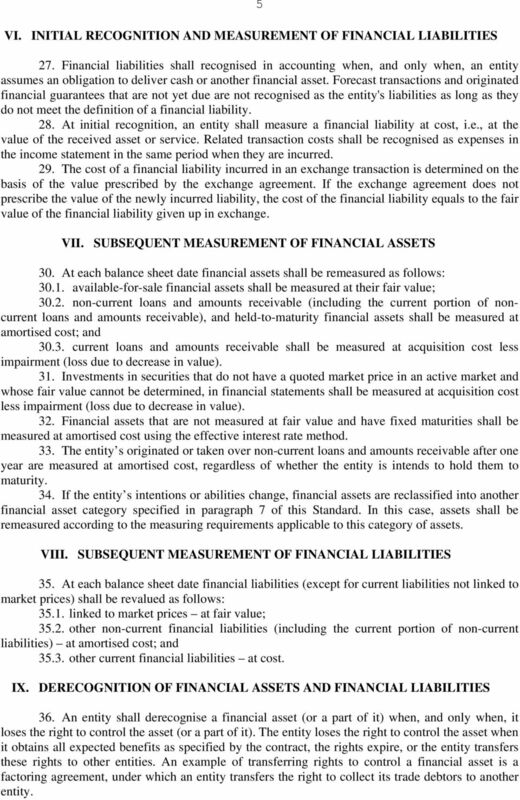 At each balance sheet date financial liabilities (except for current liabilities not linked to market prices) shall be revalued as follows: linked to market prices at fair value; other non-current financial liabilities (including the current portion of non-current liabilities) at amortised cost; and other current financial liabilities at cost. IX. 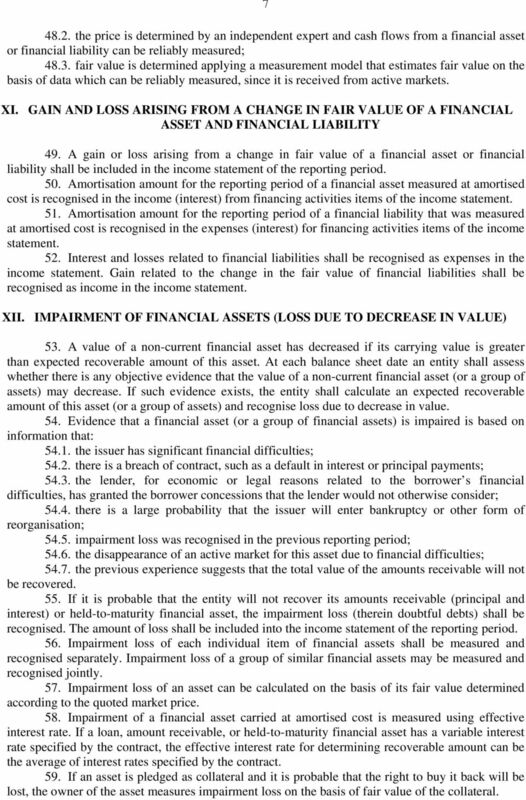 DERECOGNITION OF FINANCIAL ASSETS AND FINANCIAL LIABILITIES 36. An entity shall derecognise a financial asset (or a part of it) when, and only when, it loses the right to control the asset (or a part of it). The entity loses the right to control the asset when it obtains all expected benefits as specified by the contract, the rights expire, or the entity transfers these rights to other entities. An example of transferring rights to control a financial asset is a factoring agreement, under which an entity transfers the right to collect its trade debtors to another entity. 7 the price is determined by an independent expert and cash flows from a financial asset or financial liability can be reliably measured; fair value is determined applying a measurement model that estimates fair value on the basis of data which can be reliably measured, since it is received from active markets. XI. GAIN AND LOSS ARISING FROM A CHANGE IN FAIR VALUE OF A FINANCIAL ASSET AND FINANCIAL LIABILITY 49. A gain or loss arising from a change in fair value of a financial asset or financial liability shall be included in the income statement of the reporting period. 50. Amortisation amount for the reporting period of a financial asset measured at amortised cost is recognised in the income (interest) from financing activities items of the income statement. 51. Amortisation amount for the reporting period of a financial liability that was measured at amortised cost is recognised in the expenses (interest) for financing activities items of the income statement. 52. Interest and losses related to financial liabilities shall be recognised as expenses in the income statement. Gain related to the change in the fair value of financial liabilities shall be recognised as income in the income statement. XII. IMPAIRMENT OF FINANCIAL ASSETS (LOSS DUE TO DECREASE IN VALUE) 53. A value of a non-current financial asset has decreased if its carrying value is greater than expected recoverable amount of this asset. At each balance sheet date an entity shall assess whether there is any objective evidence that the value of a non-current financial asset (or a group of assets) may decrease. If such evidence exists, the entity shall calculate an expected recoverable amount of this asset (or a group of assets) and recognise loss due to decrease in value. 54. Evidence that a financial asset (or a group of financial assets) is impaired is based on information that: the issuer has significant financial difficulties; there is a breach of contract, such as a default in interest or principal payments; the lender, for economic or legal reasons related to the borrower s financial difficulties, has granted the borrower concessions that the lender would not otherwise consider; there is a large probability that the issuer will enter bankruptcy or other form of reorganisation; impairment loss was recognised in the previous reporting period; the disappearance of an active market for this asset due to financial difficulties; the previous experience suggests that the total value of the amounts receivable will not be recovered. 55. If it is probable that the entity will not recover its amounts receivable (principal and interest) or held-to-maturity financial asset, the impairment loss (therein doubtful debts) shall be recognised. The amount of loss shall be included into the income statement of the reporting period. 56. Impairment loss of each individual item of financial assets shall be measured and recognised separately. Impairment loss of a group of similar financial assets may be measured and recognised jointly. 57. Impairment loss of an asset can be calculated on the basis of its fair value determined according to the quoted market price. 58. Impairment of a financial asset carried at amortised cost is measured using effective interest rate. If a loan, amount receivable, or held-to-maturity financial asset has a variable interest rate specified by the contract, the effective interest rate for determining recoverable amount can be the average of interest rates specified by the contract. 59. If an asset is pledged as collateral and it is probable that the right to buy it back will be lost, the owner of the asset measures impairment loss on the basis of fair value of the collateral. 8 8 60. If during the subsequent period the amount of impairment or doubtful debt decreases, the derecognised amount must be reversed. After the reversal of the derecognised amount, the carrying amount of the financial asset shall not exceed its acquisition or amortised cost, which would apply if the impairment had not been recognised. The reversed amount shall be included into the income statement of the reporting period. 61. The carrying amount of a financial asset that is not carried at fair value because its fair value cannot be reliably measured shall be tested for indications of impairment at each balance sheet date. This is performed on the basis of analysis of discounted expected net cash flows. If there are any indications of impairment of a financial asset, impairment loss is equal to the difference between the carrying amount and the recoverable amount of the asset. XIII. DISCLOSING INFORMATION IN FINANCIAL STATEMENTS 62. 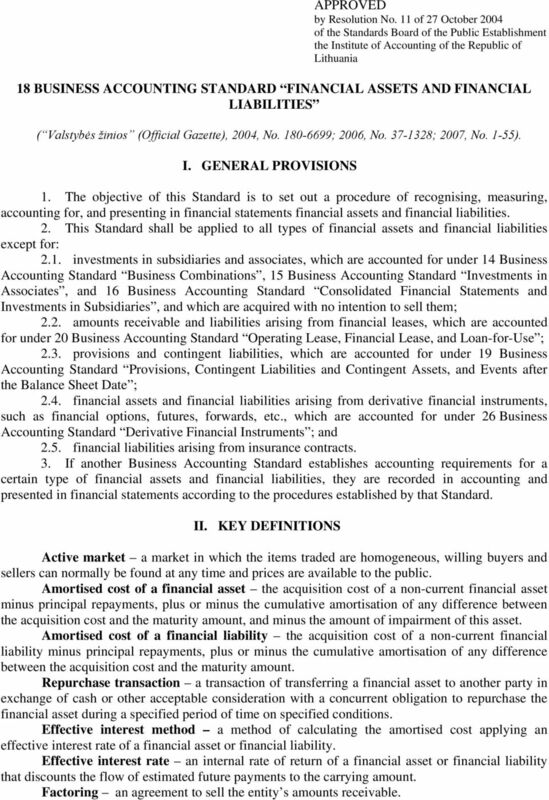 In complete explanatory notes to financial statements the following information shall be disclosed: accounting policy for financial assets and financial liabilities; criteria for recognition of financial assets and financial liabilities; methods of accounting for investments; a description of cash and cash equivalents; methods used to measure financial assets and financial liabilities and assumptions applied in determining which methods to use. 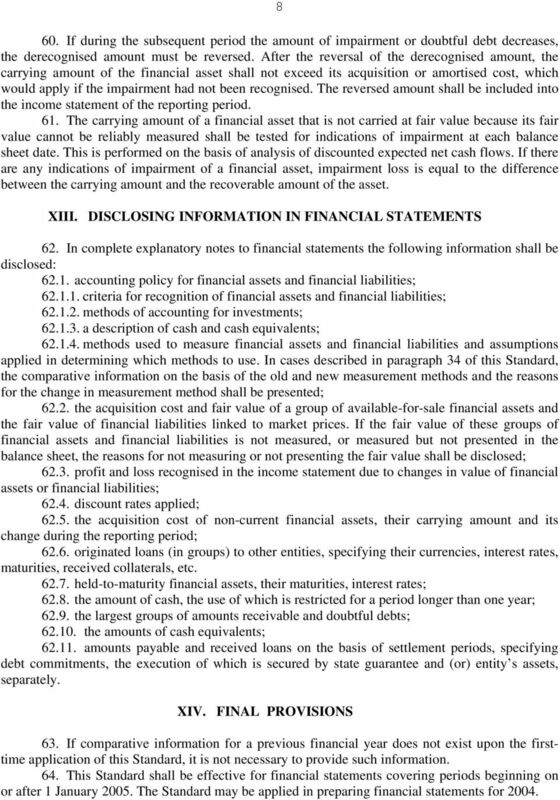 In cases described in paragraph 34 of this Standard, the comparative information on the basis of the old and new measurement methods and the reasons for the change in measurement method shall be presented; the acquisition cost and fair value of a group of available-for-sale financial assets and the fair value of financial liabilities linked to market prices. If the fair value of these groups of financial assets and financial liabilities is not measured, or measured but not presented in the balance sheet, the reasons for not measuring or not presenting the fair value shall be disclosed; profit and loss recognised in the income statement due to changes in value of financial assets or financial liabilities; discount rates applied; the acquisition cost of non-current financial assets, their carrying amount and its change during the reporting period; originated loans (in groups) to other entities, specifying their currencies, interest rates, maturities, received collaterals, etc held-to-maturity financial assets, their maturities, interest rates; the amount of cash, the use of which is restricted for a period longer than one year; the largest groups of amounts receivable and doubtful debts; the amounts of cash equivalents; amounts payable and received loans on the basis of settlement periods, specifying debt commitments, the execution of which is secured by state guarantee and (or) entity s assets, separately. XIV. FINAL PROVISIONS 63. If comparative information for a previous financial year does not exist upon the firsttime application of this Standard, it is not necessary to provide such information. 64. This Standard shall be effective for financial statements covering periods beginning on or after 1 January The Standard may be applied in preparing financial statements for 2004. The acquisition method of accounting is used to account for business combinations by the group. Compiled AASB Standard AASB 139 Financial Instruments: Recognition and Measurement This compiled Standard applies to annual reporting periods beginning on or after 1 January 2011 but before 1 January 2013. These notes form an integral part of and should be read in conjunction with the accompanying financial statements. 1. General The Company is a public limited company domiciled and incorporated in Singapore.